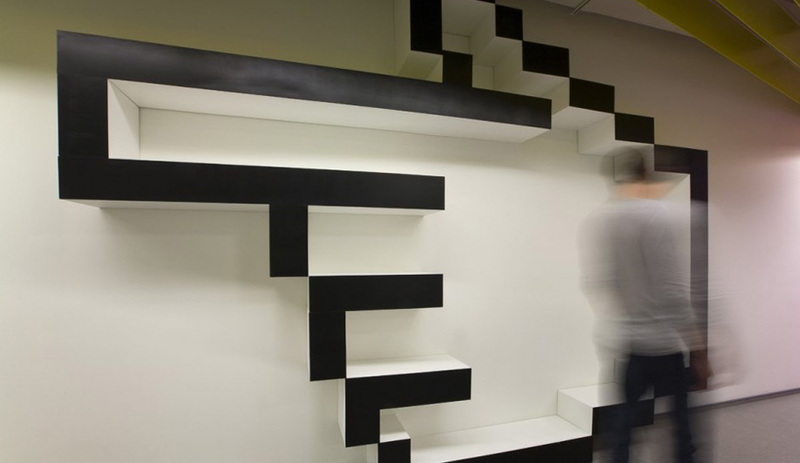 On par with the wildly energetic Silicon Valley interiors of Google and Facebook, the Russian firm transformed a Saint Petersburg office into a playful space for the internet company Yandex. Arranging workstations and communal spaces along a 200-metre-long corridor, Za Bor Architects incorporated punchy hues – Post-it note yellow, orange and green primarily – to conceal meeting rooms and cafeterias along with pixellated backgrounds and blow-up versions of such tech-y icons as the cursor arrow and the @ symbol. 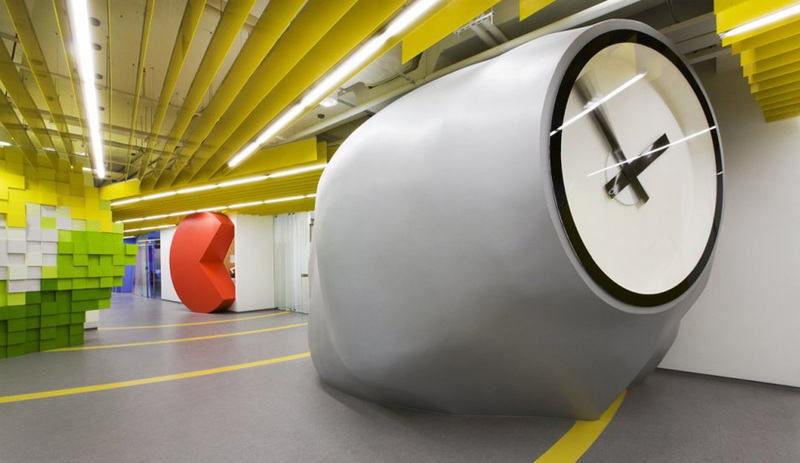 A giant blob-shaped clock, cast in polymer and painted silver, sits at the entrance, and hides a printing station. This otherworldly workspace for video production company Logan isn’t stationed on Mars, but rather within a 604-square-metre Greene Street loft in New York. Maximizing minimalism was SO-IL’s goal to create a completely collaborative space and also to cut the glare from the sun that streams in via 18 windows. Floor-to-ceiling scrims made from translucent nylon divide the interior into two work areas and shield half the windows and the plumbing. A backlit PVC stretch ceiling casts a soft glow. Even computer and equipment cables are kept out of sight, tucked beneath the wooden floors and running up the legs of two 20-metre-long tables. 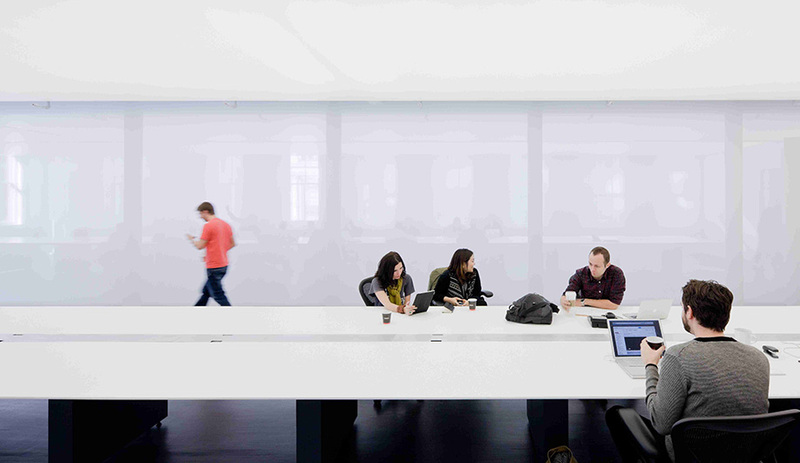 The overall effect brings the laboratory concept to a new level of stark whiteness. 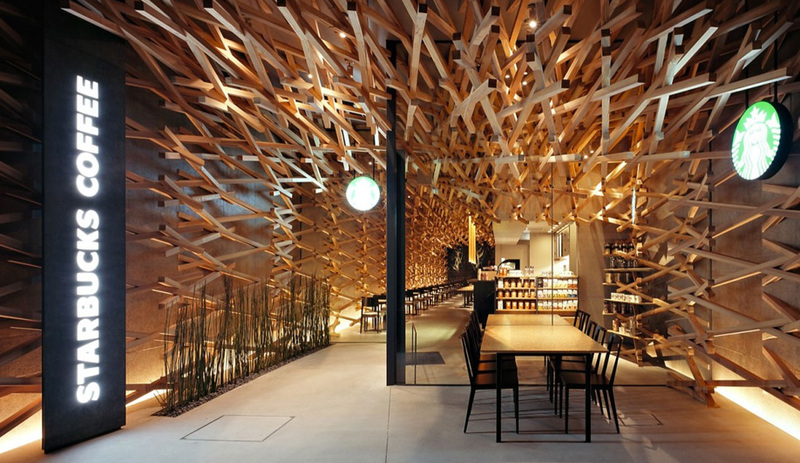 Located near a major shrine in Tokyo that dates back to 919 AD, Kengo Kuma created a stunning cafe for the world’s largest coffee house chain. 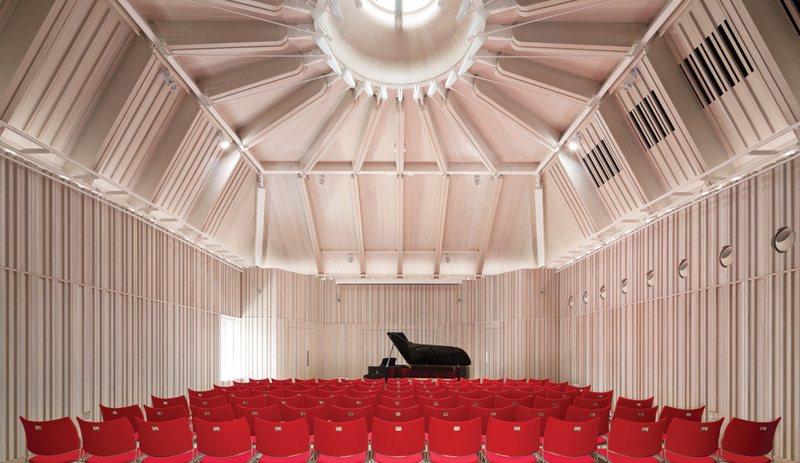 Inspired by the shrine’s wooden construction, Kuma used six-centimetre-thick sticks in lengths of one, three and four metres to create a web that crawls up and over one wall to completely conceal the ceiling and create a cavernous space. Furnished with wooden bistro tables and banquettes, the cafe is refreshingly light on logos, mood-lighting and the typical stacks of Starbucks paraphernalia. In Vancouver’s trendy east side, this concept store offers luxury fashion and lifestyle brands along with a cafe and dining area. Owner Carey Melnichuk teamed up with B+H CHIL Design to create a dramatic interior peppered with traditional accents. The store’s entrance features a Victorian-inspired pattern, while contemporary glass-topped merchandising cabinets house small accessories. Cabriole-legged display tables sit in front of a decidedly Dutch shelving unit that’s easily the most striking feature in the space where white paneled cupboards give way to a wavy reveal, morphing old doors into open and angular shelving. Very Moooi-esque! At hotelier Ian Schrager’s Public Hotel in Chicago, Yabu Pushelberg glammifed the storied restaurant that was regularly frequented by Frank Sinatra and Lana Turner in its day. The update retains the Old Hollywood charm but with a modern twist. A small bar takes the place of where a large U-shaped iteration used to be, creating room for more dining tables. 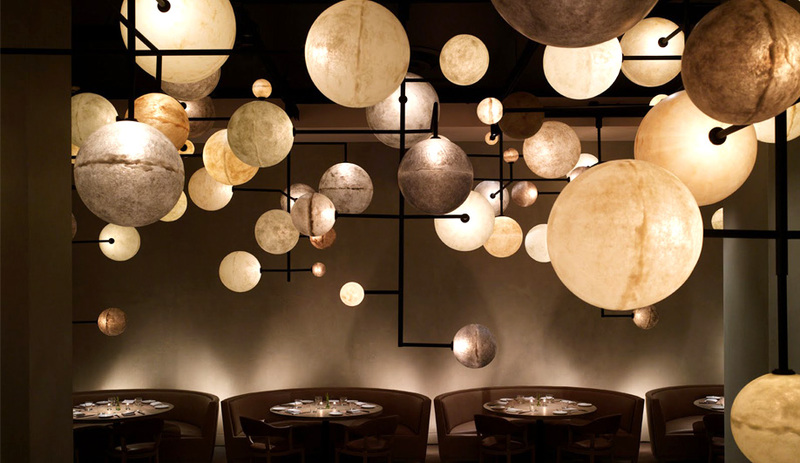 Making the most of the 5.5-metre-high ceilings, the design duo also installed a dazzling constellation of resin orbs that casts a gentle glow onto guests. For their very first one-of-a-kind product line, Dutch interior designers Jasper Jansen and Jeroen Dellensen scoured secondhand shops and vintage markets for furniture and light fixtures – as well as quirky home accents including busts of notable figures – as a starting point. After repairing each piece, the duo coated them with a solvent-free polyurea spray in matte grey. 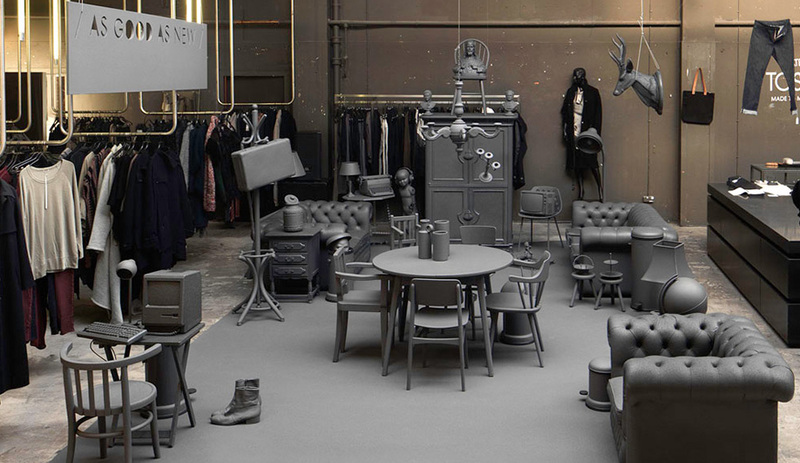 To launch the line, they opened a pop-up within the Amsterdam fashion boutique SPRMRKT, a shop that shares the line’s proclivity for brooding aesthetics. The dramatic, single-tone set-up provides an unusual platform to showcase pieces that have been given a new lease on life. Beneath the undulating roof of Zaha Hadid’s stingray-shaped venue for the London Olympics, there are three swimming and diving pools, plus room for 5,000 spectators. 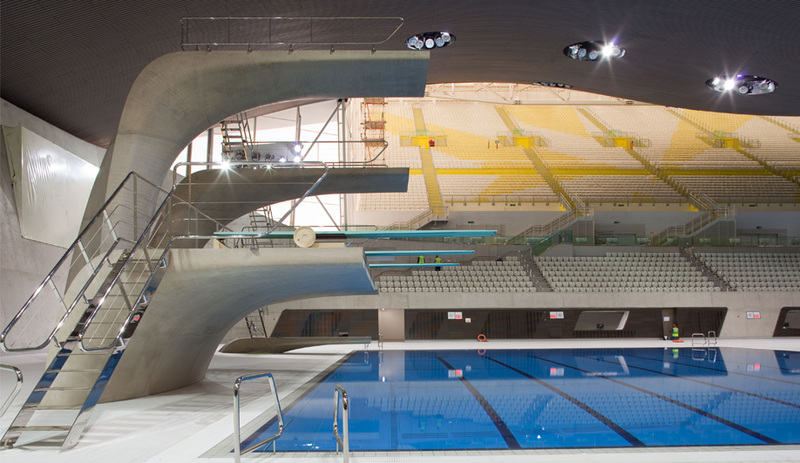 Sculptural concrete diving platforms smoothly ascend from the bowl’s floor. During the games, additional seating was temporary tacked on to both sides of the aquatic centre. These extensions are expected to be removed soon with massive glass walls installed in their place. 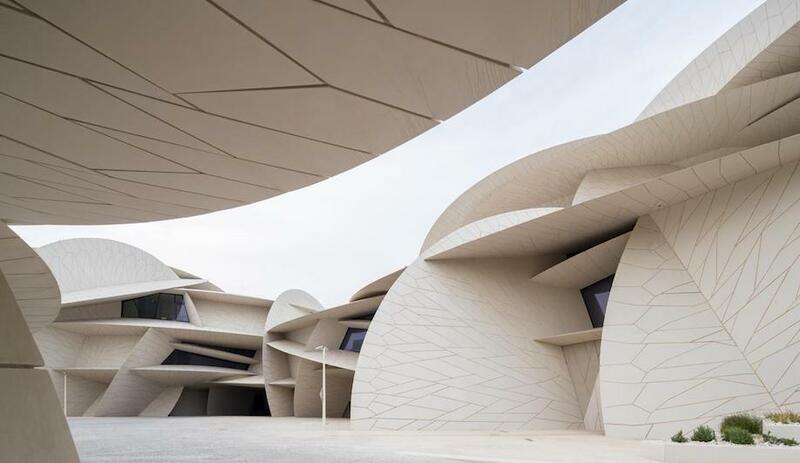 Unapologetically raw, this is a building that doesn’t sport the usual over-the-top swoops and curves typical of Hadid. It’s a refreshing change to see refinement without her usual flamboyance. In the French Alps, the prolific interior and product designer outfitted a three-storey ski lodge with furnishings that seem to grow up and out from the curved fir walls and timber eaves. The ceiling-mounted trunk-like fireplace is the scene stealer. 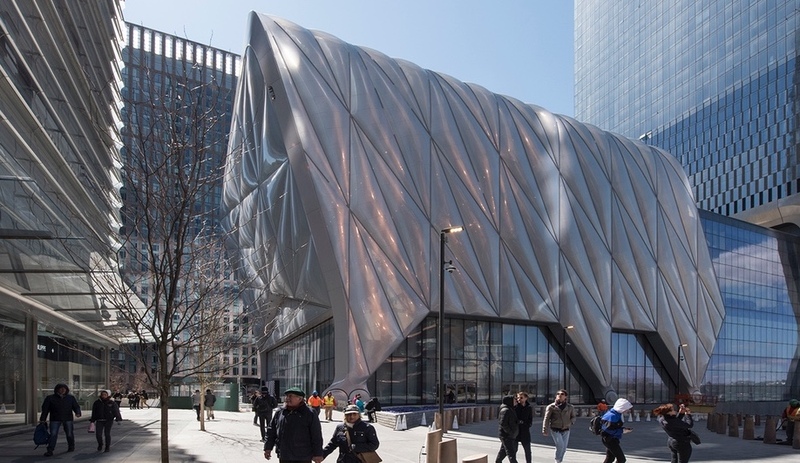 Coated in concrete, the metal structure hovers above a sheathed resin pit. Noe Duchaufour-Lawrance’s own furniture designs, including the buttery leather Derby armchair for Zanotta and a custom floating bed, are found throughout the fluid and minimalist interior. The Vancouver firm partnered with CdG creative force Rei Kawakubo on the fashion brand’s new retail space in Tokyo and re-imagined a design initially intended as portable skating shelters and originally installed in Winnipeg. 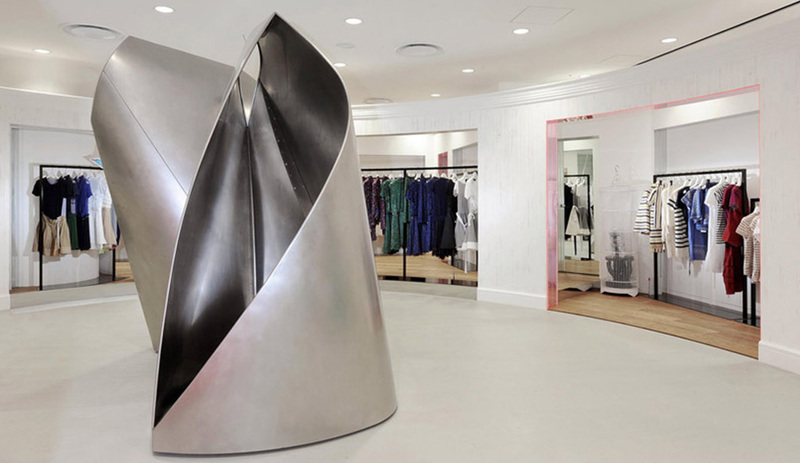 At CdG, the elegant pod-shaped stainless steel forms function as either change rooms or merchandise displays, Inside, they are fitted with acrylic lit floors and resemble cryogenic chambers. 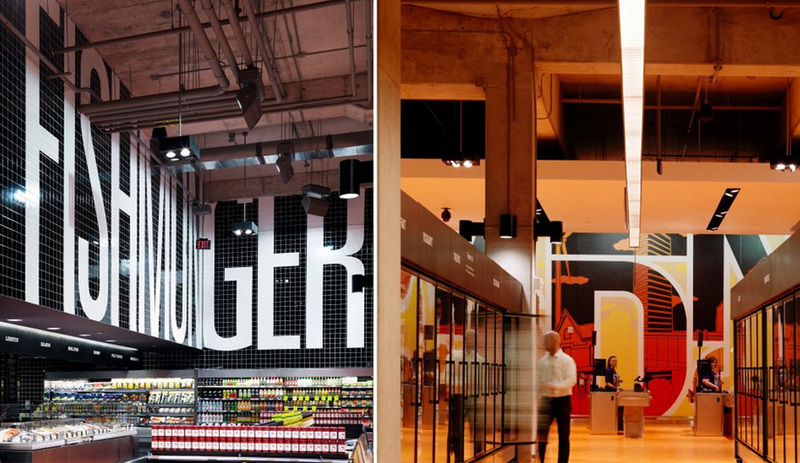 Collaborating with Toronto’s Turner Fleischer Architects, Sydney’s Landini Associates transformed the former hockey arena for the Toronto Maple Leafs into a spectacular shopping and culinary experience for the Loblaws grocery chain. A dining area, open kitchen, sprawling patisserie and massive wall of cheese are but a few of the amenities that contribute to a grocery environment rich with flavour and social interaction. The cavernous interior features bright shades of red and orange on the floors and walls, while the various food departments are identified by larger-than-life typography. Signage, which takes the form of Helvetica in both serif and sans serif, are carefully considered within each context. For instance, the bakery sign is in stainless steel reminiscent of a kitchen, while cafe signage is in chalkboard black. 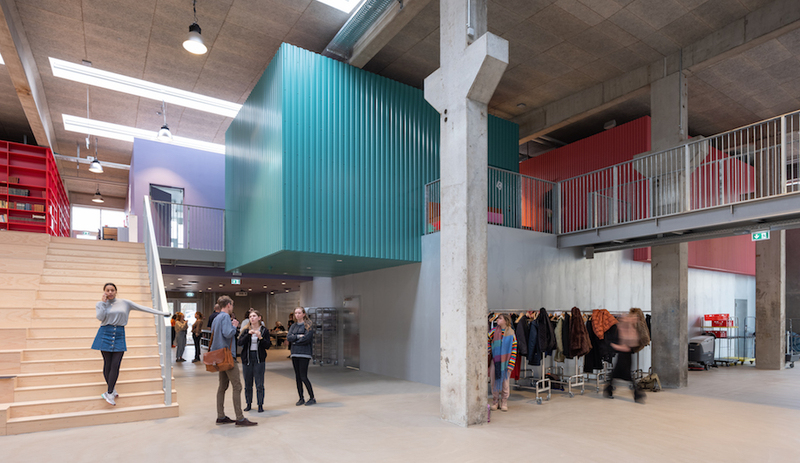 The 8,000-square-metre store is an inspiring example of how a national chain can offer a unique shopping experience.